Find hotel near Kuranda Rainforest Nature ..
Set in 100 acres of pristine rainforest, Kuranda Rainforest Nature Park is considered as Australia’s World Heritage-listed tropical forest. Come and explore this beautiful rainforest. Enjoy the experience of the Army Duck Rainforest tour within the Tropical Fruit Orchard, Pamagiri Aboriginal and Kuranda’s largest Koala & wild-park. Big Nature Package includes admission to the Rainforest including Army Duck tour, Pamagirri Aboriginal experience and Koala and Wildlife Park. 4 Park Pass includes admission to the Cairns Wildlife Dome, Wildlife Habitat Port Douglas, Rainforestation Nature Park and the Australian Butterfly Sanctuary. In the admission, food and drinks are not included. Facilities like hotel pickup and drop-off, transportation to and from Kuranda, shuttle between Kuranda village and Rainforestation Nature Park are not included in the admission fee. Confirmation about the booking is be done via email. How popular is Kuranda Rainforest Nature Park? People normally club together Australian Butterfly Sanctuary and Cairns Tropical Zoo while planning their visit to Kuranda Rainforest Nature Park. 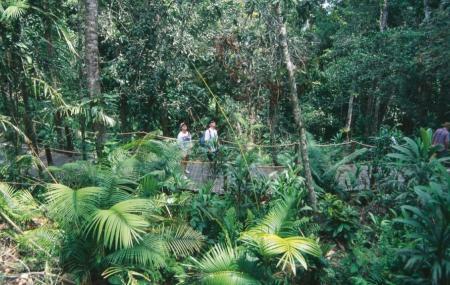 People also prefer to start their day with Kuranda Rainforest Nature Park. Great experience, you can get up close with some young wallabies and for a price cuddle a koala. The ride on the old army Ducks is a experience and the drivers are very knowledgeable and tell you all about the rainforest plants. The Aboriginal dancers give you a insight but also you get a shot at throwing a boomerang. The restaurant serves a good buffet lunch and restrooms are available all over the park. Great place!! Strongly recommended to view all Australian animals. Animals well cared for and zero stress. Love the place. Unique experience. Pros: Aboriginal show, boomerang experience, able to get close to animals. Cons: not a lot of animals. Jungle tour: very slow. Often stopped for long periods in sun. I learned some interesting stuff, but didn't see hardly anything of note. It was neat. Not as big as I was expecting but love getting to see the dingos.